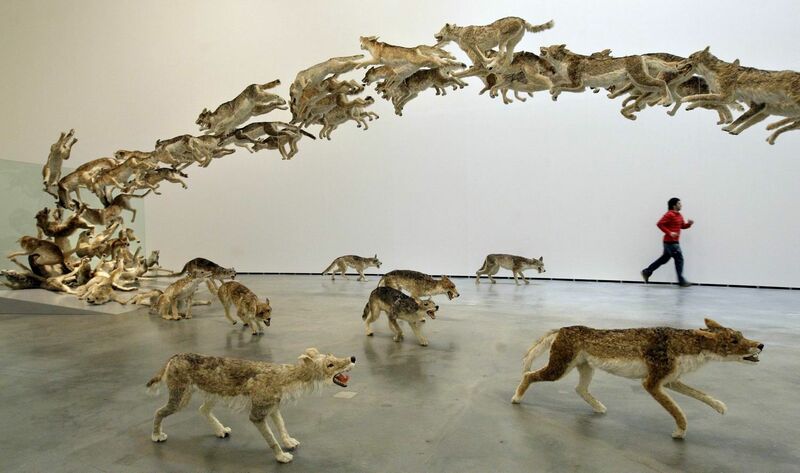 Cai Guo-Qiang was born in 1957 in Quanzhou, Fujian Province, China. He recalled as a child hearing the "upsetting yet eerily beautiful blasts of artillery being fired across the straight. "His father, Cai Ruiqin, was a calligrapher and traditional painter who worked in a bookstore. 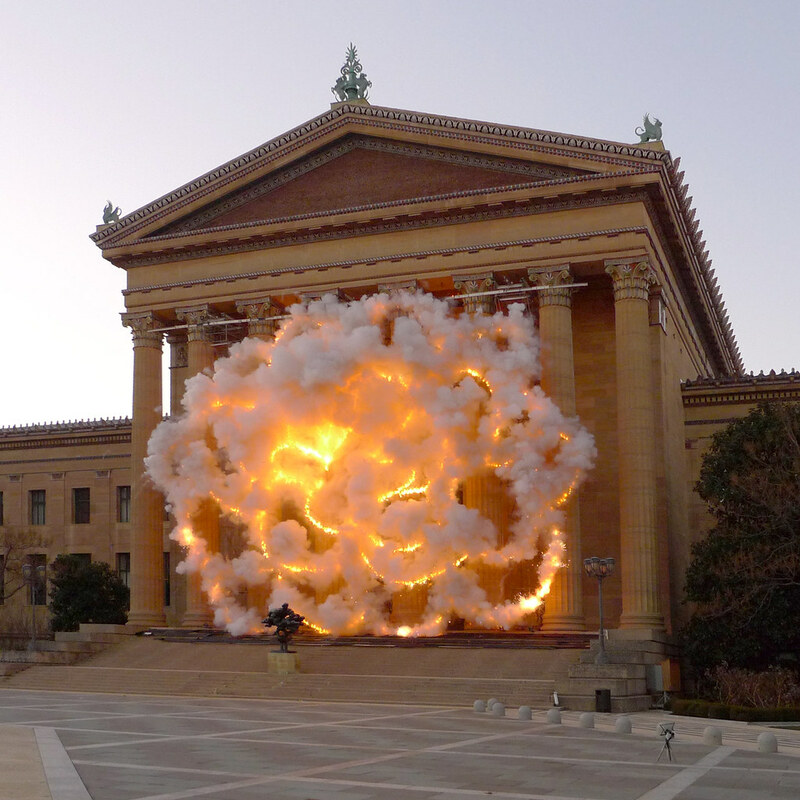 As a result, Cai Guo-Qiang was exposed early on to Western literature as well as traditional Chinese art forms. As an adolescent and teenager, Cai witnessed the social effects of the Cultural Revolution first-hand, personally participating in demonstrations and parades himself. He grew up in a setting where explosions were common, whether they were the result of cannon blasts or celebratory fireworks. He also “saw gunpowder used in both good ways and bad, in destruction and reconstruction”. It seems that Cai has channeled his experiences and memories through his numerous gunpowder drawings and explosion events. 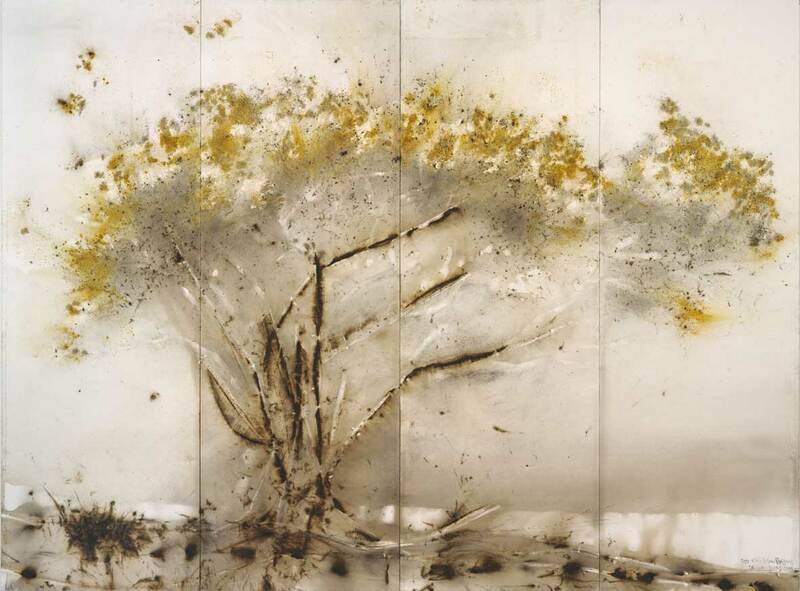 In his late teens and early twenties, Cai Guo-Qiang acted in two martial art films, The Spring and Fall of a Small Town and Real Kung Fu of Shaolin. Later intrigued by the modernity of Western art forms such as oil painting, he studied stage design at the Shanghai Theater Academy from 1981 to 1985. The experience allowed him a more comprehensive understanding of stage practices and a much-heightened sense for theater, spatial arrangements, interactivity, and teamwork. Cai Guo-Qiang's practice draws on a wide variety of symbols, narratives, traditions and materials such as fengshui, Chinese medicine, shanshui paintings, science, flora and fauna, portraiture, and fireworks. Much of his work draws on Maoist/Socialist concepts for content, especially his gunpowder drawings which strongly reflect Mao Zedong's tenet "destroy nothing, create nothing." Cai has said: “In some sense, Mao Zedong influenced all artists from our generation with his utopian romance and sentiment." Cai's work, inspired by an interest in traditional Chinese culture and the everyday aspects that defined it, is scholarly and at times politically charged. As a student, Cai made works consisting of stick-figure or abstract patterns in oil and burnt gunpowder, giving him a place in the experimental ferment preceding the '85 New Wave. However, Cai moved to Japan in 1986 as the movement was building. 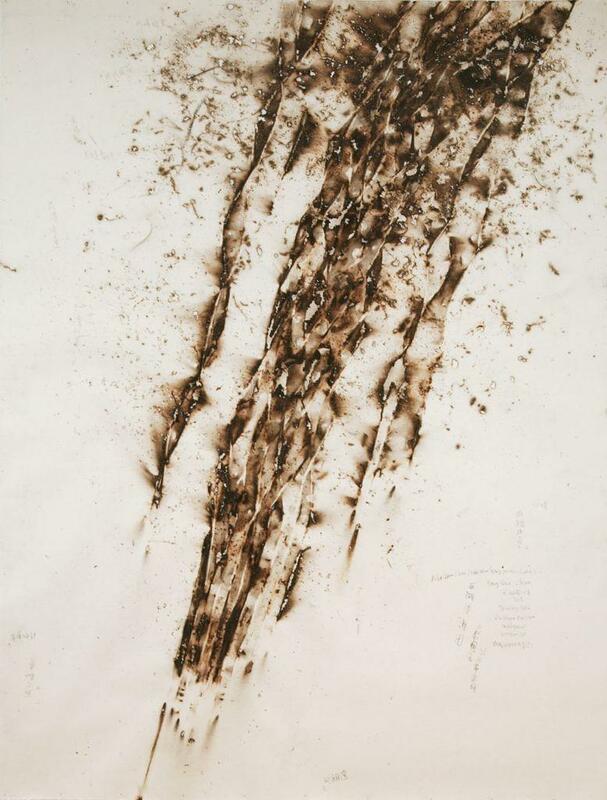 In 1990, Cai began "Projects for Extraterrestrials", which consisted of using large fireworks and extensive trails of blazing gunpowder that span across landscapes and building surfaces. Site-specific, the projects were implemented in various locations throughout the world. Project to Extend the Great Wall of China by 10,000 Meters: Project for Extraterrestrials No. 10 (1993) was representative of the nature of the projects as a whole, as it involved an approximately six-mile-long gunpowder fuse that extended beyond the western end of the Great Wall at the edge of the Gobi Desert. The fuse burned for about 15 minutes after it was lit, creating a dragon-like pattern across the dunes that was indicative of China's imperial and mythological heritage. The title for the series refers to Cai's inspiration for the project: the belief in a need for a new, higher perspective in which celebrations of pure energy replace earthly conflicts, and gunpowder, the "material fuel" of such conflict, becomes a system that delivers beauty and joy. Cai initially began working with gunpowder to foster spontaneity and confront the suppressive, controlled artistic tradition and social climate in China. 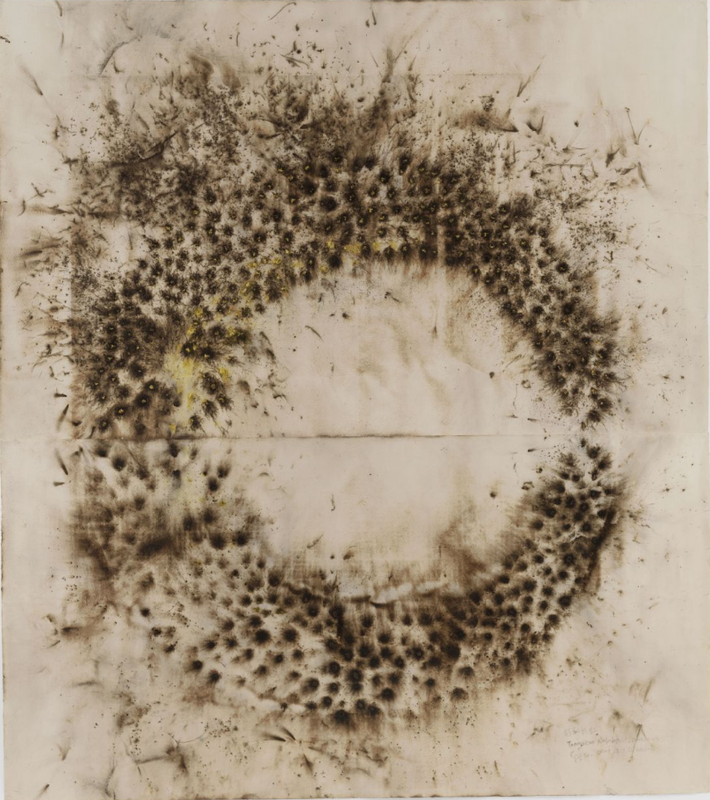 While living in Japan from 1986 to 1995, Cai explored the properties of gunpowder in his drawings, an inquiry that eventually led to his experimentation with explosives on a massive scale and the development of his signature "explosion events". In 1995, he moved to New York with a grant from the New York-based Asian Cultural Council, an international organization that promotes artistic exchanges between Asian countries and the United States. Nine cars arced through the 300 foot long gallery, tumbling and suspended in mid-air as if by stop-action. Long transparent rods radiated from the car, pulsing with dazzling multicolored light. 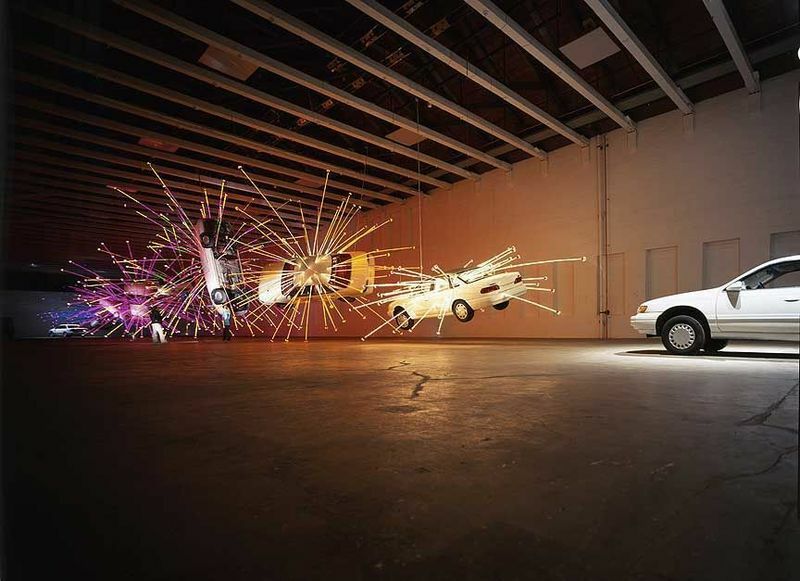 An explosive moment, expanded in time and space as if in a dream, the cars formed the centerpiece of Inopportune by Cai Guo Qiang. 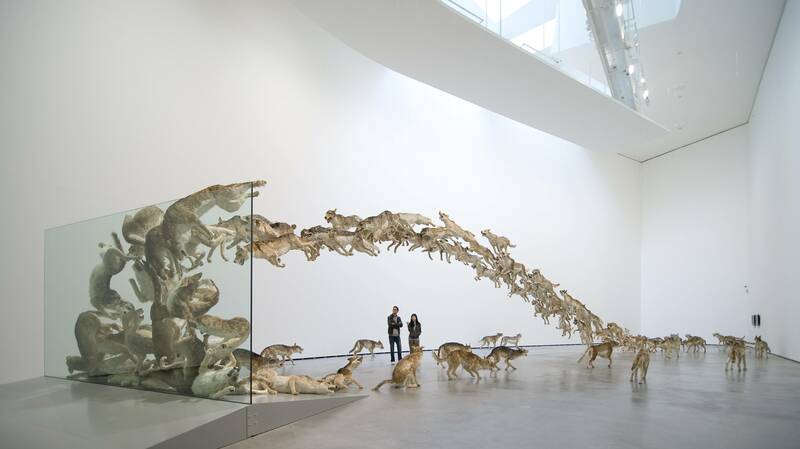 An adjacent gallery opened for the installation housed Inopportune: Stage 2, in which nine realistic tigers also hovered in the air, each one pierced by hundreds of arrows. The imagery in this gallery referred to the famous 13th-century Chinese story epitomizing bravery, in which a man named Wu Song rescued a village by slaying a man-eating tiger. In yet a third space, a phantom car bristling with fireworks floated like a ghost through the glittering illusion of Times Square at night. Engaging images of our unsettled world, Inopportune created a theatrical, psychologically charged space in which to reflect on some of the most pressing dilemmas and contradictions affecting us such as terrorism and cultural, religious conflict, violence and beauty, the meaning of heroism. In an interview in The Brooklyn Rail, Cai said of his piece Light Cycle, commissioned by Creative Time in 2003: "Because this was a post 9/11 New York I wanted to provide an anchor and reference point for people to feel hope. That is why I picked the reservoir in Central Park and made a full circle. It is kind of a protection, a symbol for comfort and fullness." Cai is one of the most well-known and influential Chinese contemporary artists, having represented his country at the Venice Biennale in 1999 with his project Venice's Rent Collection Courtyard, a time-based sculpture which he had artisans recreate the Rent Collection Courtyard, a famous work of Socialist Realist propaganda sculpture. Cai returned to Venice in 2005 to curate the Chinese pavilion. His work has also attracted controversy. Venice's Rent Collection Courtyard drew condemnation within China from the original authors of the Socialist Realist sculpture for destroying their "spiritual property." Some critics have asserted that while his work references politics and philosophy, he seems to switch positions at will and that the references seem relatively opportunistic. 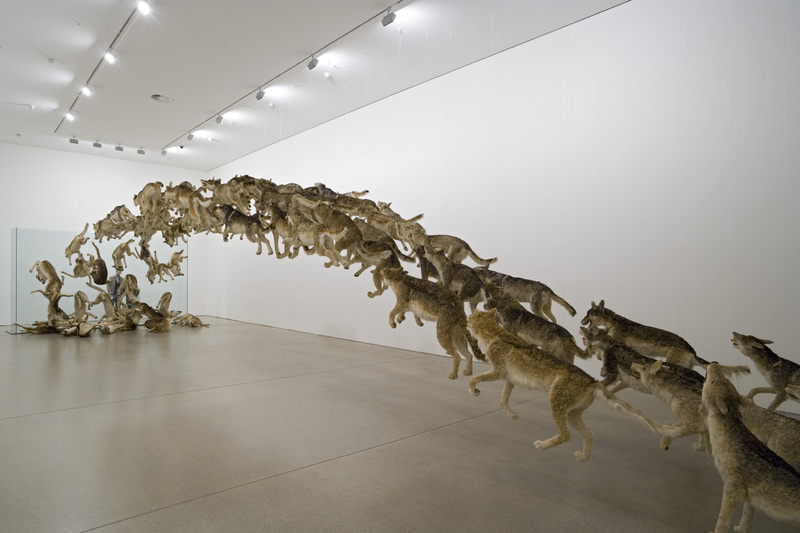 From May 2–September 25, 2010, Cai was featured in the solo exhibition Cai Guo-Qiang: Peasant Da Vincis, which presented works from peasants in China. This includes homemade airplanes, helicopters, submarines, and robots. Cai also created Odyssey, a permanent gunpowder drawing for the Museum of Fine Arts, Houston in Fall 2010. Installed as part of the museum's ongoing Portal Project and stretching across forty-two panels, it is one of his largest gunpowder drawings to date. 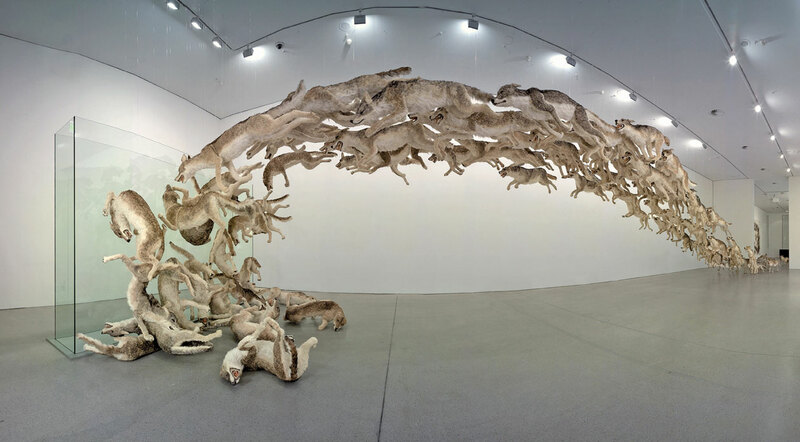 Another solo exhibition, 'Cai Guo-Qiang – 1040M Underground, was on view at the new foundation IZOLYATSIA. Platform for Cultural Initiatives in Donetsk, Ukraine through the fall of 2011. In December 2011, Cai Guo-Qiang: Saraab opened at Mathaf: Arab Museum of Modern Art in Doha, Qatar - the artist's largest since his 2008 retrospective at the Guggenheim Museum and his first solo exhibition ever in a Middle Eastern country. Saraab (mirage in Arabic) features more than fifty works, including seventeen newly commissioned pieces, thirty recent works and nine documentary videos. The exhibition opened on December 5th with Black Ceremony, the artist's largest ever daytime explosion event and includes several large-scale site-specific installations.